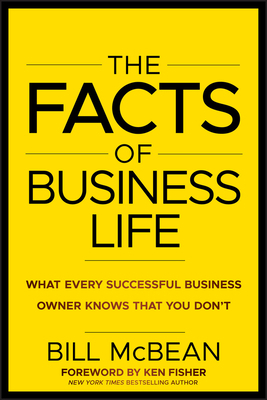 Written by a successful business owner with four decades of experience, The Facts of Business Life is full of real-world concepts that owners must use and embrace if they want to become and stay successful. This multiple award-winning book has been endorsed by some of America's top business leaders, like Steve Forbes and Ken Fisher, and has been recognized as "one of the best five business books of the year" and "a must read for entrepreneurs or those wanting to be one." McBean begins with clear explanations and real-life examples of the seven Facts of Business Life that every successful business owner knows and executes consistently, including exactly what they are as well as how and when to use them. He then goes on to show how those facts impact on the five levels every successful business passes through, from "Ownership and Opportunity" to "Moving On When It's Time to Go," explaining that while the facts themselves remain the same, as a business becomes successful and moves through its life cycle, the way they are applied must change to fit changing circumstances. Its principles are based on the author's own experience in starting and running successful businesses in a variety of industries. It shows that the most successful businesspeople create profitable opportunities rather than wait for them to present themselves. It enables readers to analyze the likelihood of their own success based on the characteristics most successful owners have. It reveals the #1 priority for all owners and their employees, and why every owner needs to continually focus on it (Hint: it's not being profitable). It emphasizes that becoming successful is no guarantee that success will last, and that success itself can be a trap that eventually leads to failure. It shows that a business's culture isn't just a mission statement but also the processes created to operate the business and the employees who implement them. It discusses the steps that must be taken even before a business is started to increase the odds of its becoming a lasting success. It covers every step in a business' life cycle, including the last one, showing that the best time to exit a business is when you don't have to, and that unless you pick that time, someone else will. MANY BUSINESS BOOKS INCREASE THEIR READERS' KNOWLEDGE--THE FACTS OF BUSINESS LIFE NOT ONLY INCREASES THAT KNOWLEDGE, IT SHOWS YOU HOW TO TURN IT INTO PROFITS. BILL McBean spent many of his nearly forty years as a successful business owner in the automobile industry where, among many other achievements, he purchased several underperforming dealerships and turned them into a successful business enterprise with yearly sales of more than $160 million. Since selling the company to the world's largest automotive retailer, AutoNation, McBean has been involved in several new businesses, including McBean Partners, an investment and business mentoring company, and Net Claims Now, which provides administrative services and support to the restoration industry.